Living earth is quite cool. Don't know if it's a widget. Works on ipad, iphone and mac. Enjoy a stunning live 3D simulation of our planet with global weather, forecasts and world clock for cities around the world. View live global cloud patterns, hurricanes and tropical storms. Explore and experience amazing weather dynamics on our planet with real-time 3D weather maps and typhoon and hurricane tracking. 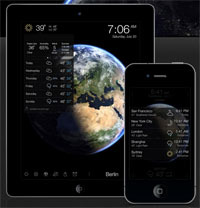 Living Earth is the best and most beautiful World Clock, Weather and Alarm available for your iPhone and iPad!